The EZ220 and EZ420 series has been discontinued. Please see the GP Series as a possible alternative or contact our Automation Engineering department. 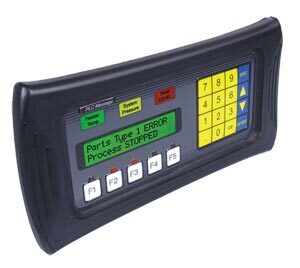 EZ Series Text Panels and EZ Series Text PLCs have been enhanced to incorporate a vacuum fluorescent display that has greater visibility as well as a wider viewing angle. The annunciator lamps on the EZ-220P and EZ-220PV models are configured similar to pushbuttons. Once you have selected the starting address in the PLC, all of the lamp colors will be identified by the bit pairs. The color that the lamp illuminates depends on the bit assignment of the address selected. There are two message types which can be displayed: local and PLC. Local messages are displayed on the screen unless the PLC triggers a PLC message, which overrides a local message. When a PLC message is triggered, the PLC Message LED will also be illuminated. The PLC message LED will remain on until the user acknowledges the situation by pressing [esc] on the panel. NOTE: Programming software (EZ-SERIESEDIT-E) and programming cable (EZ-SERIES-PGMCBL) required.